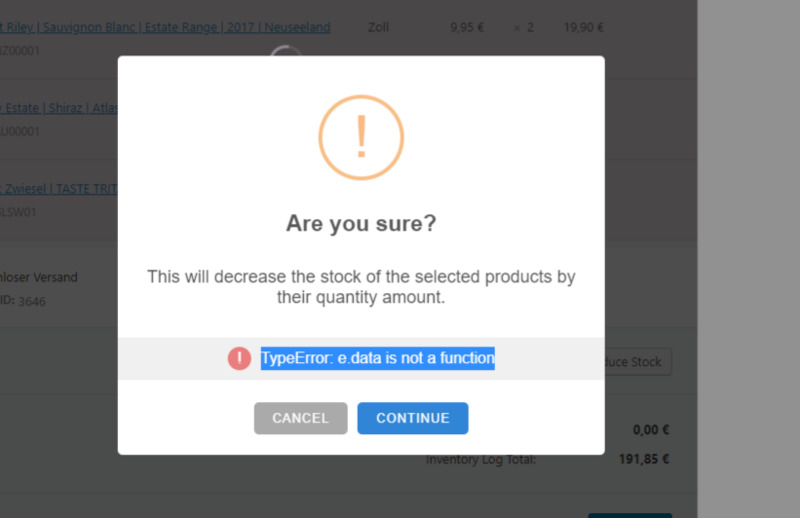 While reducing the stock on the inventory log I am getting the error: " TypeError: e.data is not a function". What could be causing this issue? We will test, but can you confirm if you are using any premium addon and what product type is this, pls? As well as that, what is the version of WP, WC, ATUM and PHP, pls? The issue was now found and fixed, however, it is affecting a much bigger and complex function change so we can not immediately release. However, it will be included in the next version of ATUM. Please, look out for the next update. Dear Pavel, same bug here. Any date for this release ? Just tried on your demo.multi-inventory.stockmanagementlabs.com with the same version as I have 1.5.7.2 and it's working fine on your demo site. Thanks for the correction it seems to work normally. As long as I'm there it's a pity that this function does not add references to increase the stock. For example, if I scan the same code twice, Atum just adds one article and not two. This should be normal operation when receiving goods for example. As we mentioned many times before, ATUM is about 3 years old if you compare it to human life. Tons of years and improvement ahead. We value all insights and feel free to post separately all your requests. Even though I think they are on my list already, but I often prioritise features wanted more.